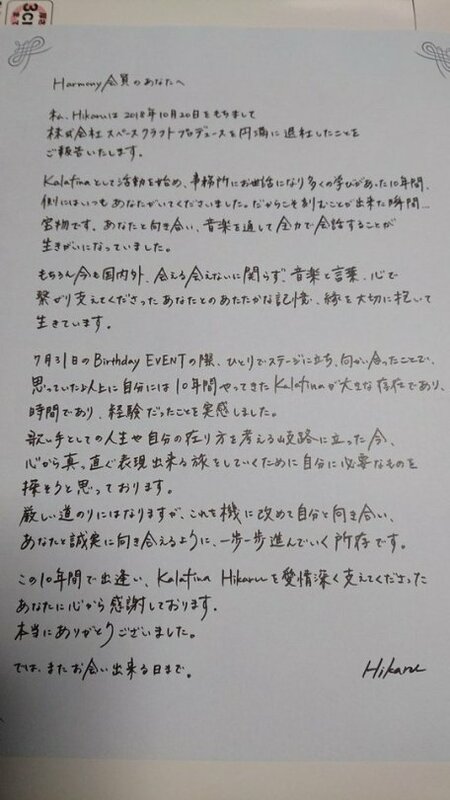 Today, the Kalafina LINE blog updated with a message by Hikaru, stating the she also left Kalafina and Spacecraft starting October 20 2018. A handwritten version of the letter was sent to the Harmon Fanclub members. At this point, all that remains is an official disbandment announcement. Thanks to HimeWakana for the news! Does that mean that Kalafina is over for good and will never get back together? Suddenly, my album folder for theirs filled with nostalgia. Kalafina was my very first love vocal group. Actually I don’t really like vocal group or girl band kind of band. Sometimes when I heard others, it feels so stuffy, like too much instrumental, too dj-ish, the lyrics not beautiful, the voices too rough or the backing vocal too loud, can’t mix well with the other. The first time I know Kalafina, I was listening Kimi ga Hikari ni Kaeteyuku, and I got a chill. The song’s so low profile but those three gave it a soul and I really love Kajiura’s music composition. No exaggerate high note, the backing vocal mixed so well that at that time I thought Keiko’s also a soprano. I hope they’ll be happy with their own different path. Success! I’m so sad that they all disbanded, but it is true that maybe it is also a great start for something, just hoping that they still keep good relationship, maybe collab concert again in the future. 10 years is a good run, and while there was a stretch of hit singles that all sounded the same, the fact of the matter is, there was no one like Kalafina. For aspiring young talent, they are the ones to beat. Finally watched the Farewell concert, and what a send-off it was! However, I’m not entirely ruling out the possibility of a re-union someday–being a Yes fan, I’m used to band break-ups followed by returns! But if this is truly it, let’s be thankful for all the wonderful music–some of Kajiura’s best–and all the best to those elegant ladies. It pains me that I never got to see them live, at least once, before the disbandment. Their voices are the most beautiful combination I will ever hear. Thank you Kalafina and Kajiura for an amazing discography. I will be listening to it until I can’t anymore.